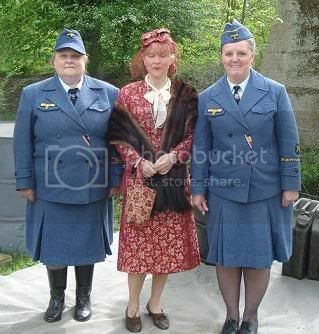 wwii axis reenactment forum • View topic - Marinehelferin & DRK uniforms. Post subject: Marinehelferin & DRK uniforms. 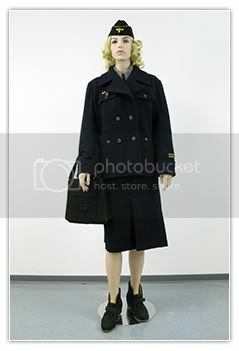 A good start for a uniform would be the Marinehelferin summer uniform comprising of a white skirt, white short sleeved blouse with a bevo type Kriegsmarine eagle above the right pocket. An anchor brooch was worn with this or sometimes a black tie. 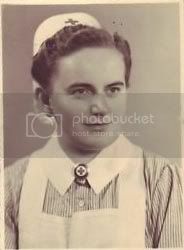 A navy blue side cap with a smaller KM bevo cap eagle (minus the cockade for female staff) was also worn along with white ankle socks and black lace-up shoes. 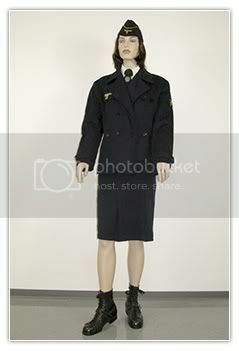 The main Marinehelferin Service Uniform can be seen being worn by female members in our photo section on the main website. 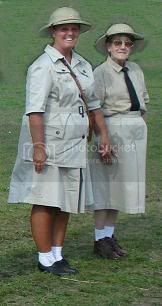 This uniform was a blue version of the grey army style double breasted tunic with a double pleated skirt. Please note that the Blue and yellow 'Marinehelferin' cuff-title was worn on the left sleeve. 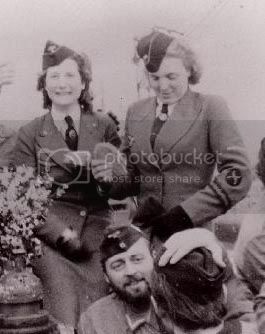 You will also note that a 'Fernschreiber' (Telegraphist) trade patch is worn above the cuff title by the helferin on the right in the period photo below, as does our member on the right in the colour photo. 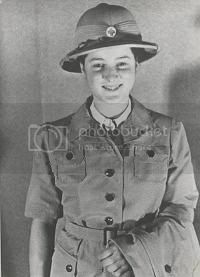 Also worn with this particular uniform was a pale blue shirt, a round blue brooch with a gold anchor motif in the centre affixed to a black regulation tie and a matching blue side cap or navy ski cap without the button flap. This can be worn with stockings (or plain modern tights) or white ankle socks. Black lace-up shoes or the female version of the jackboots completed the uniform. The grey workdress is also an option. Similar in design and colour to the Heer (Army) work dress, the Marinehelferin work dresses were designed to be worn over the formal service uniforms. There were two versions, either a grey satin double breasted dress or the more standard single breasted grey drill version of the dress. 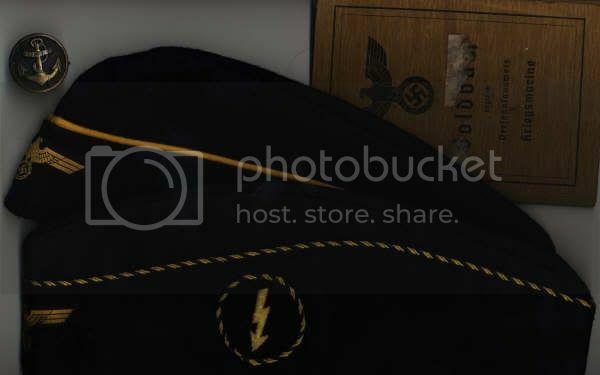 Navy blue and gold Kriegsmarine insignia, usually comprising of the Hoheitzeichen (national eagle) and trade patches, where appropriate, were applied to these dresses. They were worn with the navy blue version of the sidecap when worn outdoors, but headwear was hardly worn at all when working inside. 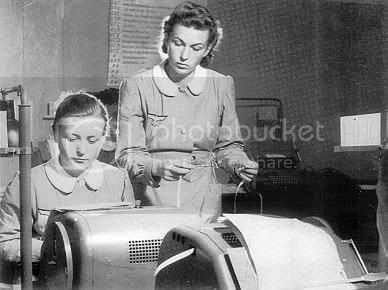 Below, Kriegsmarine telegraphists at work. Above, an original Marinehelferin cuff title. Above, a rather faded, original, Marinehelferin 'Anchor' brooch. An assortment of Marinehelferin items. *Please note the original MH anchor brooch at top left. In the centre is the lower ranking navy-blue MH schiffchen with basic golden-yellow cord. 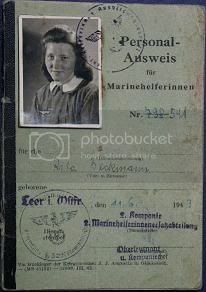 Below that is the higher ranking Marinehauptfuhrerin schiffchen with signals laufbahn insignia bordered with 'twisted' golden-yellow & blue cord. 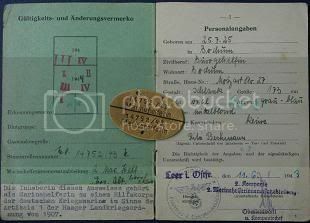 Please see the following clip from the German film 'Die Gustloff.' 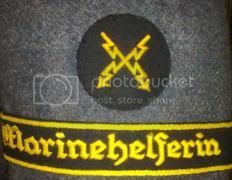 There are Marinehelferinnen featured in the film. Over 300 died when it was sunk in 1945. 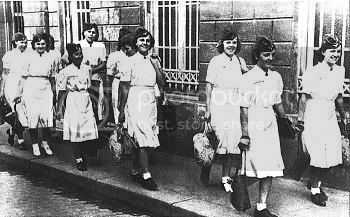 We also have members wearing the DRK Tropical uniform which is a sand coloured short sleeved Tunic, sand coloured skirt or culottes, a pith helmet or DRK type 2 nurses cap and the same footwear as above. Standard continental DRK uniforms are also acceptable as we already have members wearing those. There are other uniforms that are acceptable for wear with our group but please ask first as all these items can be expensive. Post subject: Re: Marinehelferin & DRK uniforms. I've sold the majority of my W-SS ones, keeping only a couple of PZ ones for my armoured car. The rest are DAK & Kriegsmarine.